I was working on a project where all my SharePoint inherits from a custom master page with predefined Page Layout. I got a requirement where i need to create few pages with different layouts. There are various ways to do this. One is to create a new Page Layout by coding and select your layout while adding new page to Page library, another way is to create a new master page (i.e. create a blank master page). I followed second option. I created a copy of existing master and modified it accordingly. I added a page with existing Page Layout. 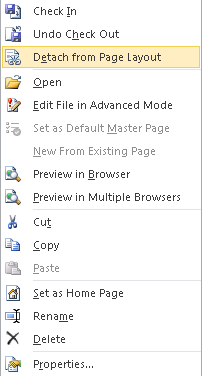 I opened that page in SharePoint Designer 2010 and changed the master page name from top of the section. I checked in file and published.but it was showing my custom master page layout. This is because your page is attached with an existing Page Layout. To detach page layout, open Page Library, Right Click on Page and Select "Detach from Page Layout". If you are getting below error (as shown in below screen). Then you must verify path of your master page file. Hope this will help you. If you like this blog, please like and share on facebook and other social media platform.